This letter was sent to Mississauga media outlets, as well as city councillors, on behalf of Coyote Watch Canada and The Furbearers. Living with wildlife can be challenging, but it is both possible and beneficial for residents to learn how. At times when we mourn the loss of a beloved family pet, these discussions are difficult, as understandable anger gets directed at the wildlife who shares our communities. Encounters and conflict often occur because of resources and changes to infrastructure. By identifying and removing attractants, such as accessible garbage, outdoor pet food, overflowing bird feeders, and fallen fruits or berries, we can limit inappropriate contacts. Complex predator-prey relationships exist in all healthy ecosystems. In urban areas, common carnivores that can come into conflict with people or pets include eagles, hawks, owls, coyotes, foxes, minks, weasels, raccoons, and roaming domestic cats and dogs. Keeping pets observed in backyards, on leash in natural spaces, and preventing roaming, are easy ways to keep them – and wildlife – safe from disease, vehicular collisions, and other types of risks that can lead to injury or death. Talk to neighbours and report to the municipality when people are inappropriately feeding wildlife. Remember that feeding a dog outside, or giving peanuts to a squirrel, can attract other animals to your and your neighbours’ yards. Please remember that animals want the same thing we all do – a safe place to raise a happy family. By taking simple steps to co-exist, we can make that reality for us all. 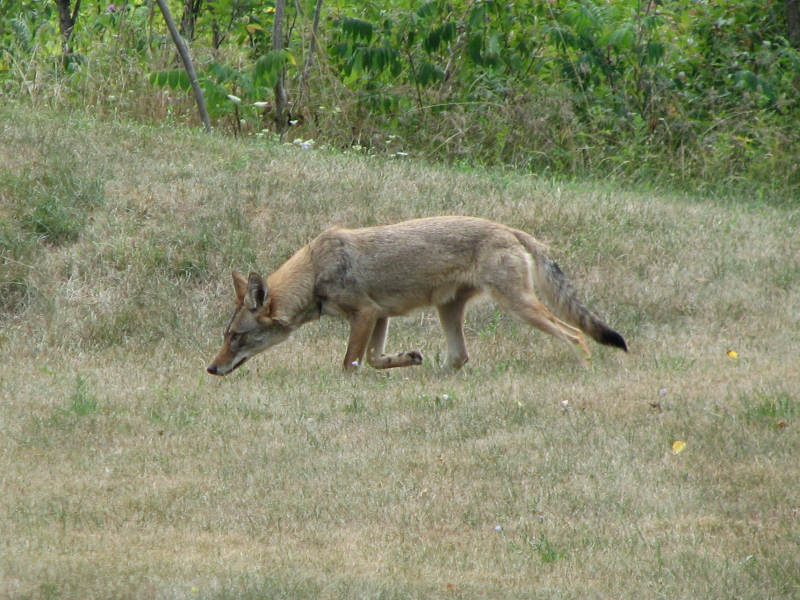 Learn more about wildlife co-existence at CoyoteWatchCanada.com and TheFurBearers.com.